Registration is now open for the June 26-27 event at the Grand Sierra Resort and Casino in Reno, Nev. The Ontario Clean Technology Alliance is generating manufacturing momentum across Ontario and members of the Alliance are attending WINDPOWER 2013 in Chicago this week to encourage expanding wind companies to join the community of international wind companies setting up shop Ontario. �	Established in Port Blair, the capital city, it is the first on-the-grid PV solar project on the Andaman and Nicobar Islands. �	The 5MW delivered by PROINSO for this project add up to the 55MW in PV materials supplied to solar energy projects in India so far. �	The materials for the solar farm in Port Blair were delivered via Cirus Solar, PROINSO's strategic partner for de Indian market, �	Currently, there are 96 Indian Qualified Installers in PROINSO's International Network. Last year, the firm set up an office in Mumbai. New West Technologies, LLC (New West) has announced the appointment of Steve Hauser as the new President of New West. Mr. Hauser is a renowned expert in renewable energy and smart grid technologies, bringing new knowledge and experience to the New West team. Clenergy will display a number of key IP-protected products, including its innovative 3D software online tool PV-ezDesign and its PV-ezRack Mounting Systems and inverters, which can be applied in residential, commercial and utility scale deployments. 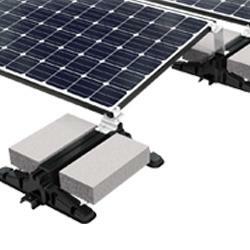 Moreover, the new carport PV mounting system PV-ezRack CarPort will make its debut in China. Clenergy is looking forward to meeting you in our booth W3-610! Assurant, Inc.'s solar group (http://www.assurantsolar.com) named industry veteran David Smith to the new role of senior product manager. In this position, Smith will develop innovative insurance products and services to reduce project risks for solar developers, owners and lending institutions. Alternative Utility Services and Community Green Energy attended the NJ Conference of Mayors Spring Conference to discuss how NJ Government Energy Aggregation can be used with renewable energy solutions such as Virtual Solar Power Purchase Agreements (VSPPA). The U.S. Army Corps of Engineers installed 55,263 square feet of solar wall on the Defense Logistics Agency's Eastern Distribution Center in New Cumberland, Pa.